Peter Schaffer's iconic play Amadeus has returned to the National Theatre in a spectacular new production directed by Michael Longhurst, with Lucian Msamati as Salieri, Adam Gillen as Mozart, Karla Crome as Constanze Weber, Tom Edden as Joseph II, plus Alexandra Mathie, Hugh Sachs and Geoffrey Beevers. 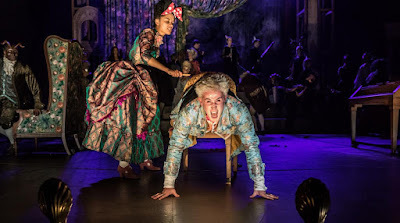 Part of the production's ethos was the extensive use of live music performed by sopranos Fleur de Bray and Robyn Allegra Parton, mezzo-soprano Wendy Dawn Thompson, tenor Eamonn Mulhall, and bass baritones Peter Willcock and Matthew Hargreaves, with the Southbank Sinfonia. 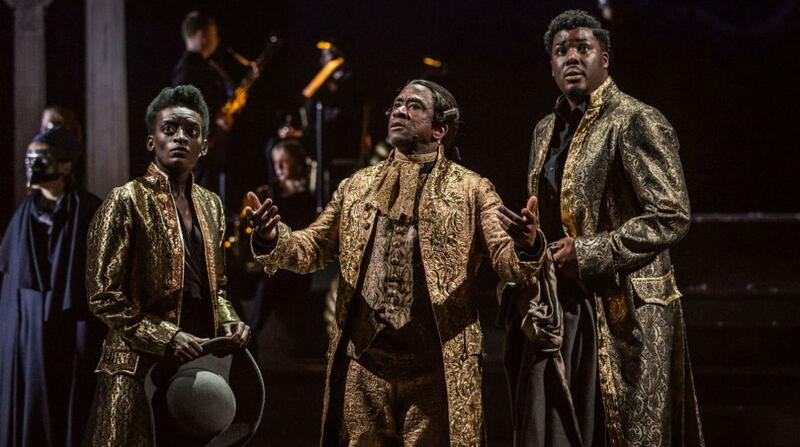 We caught the performance in the Olivier Theatre on Wednesday 30 November 2016. The production did not just use live music, but the musicians of the Southbank Sinfonia were an integral part of the production. 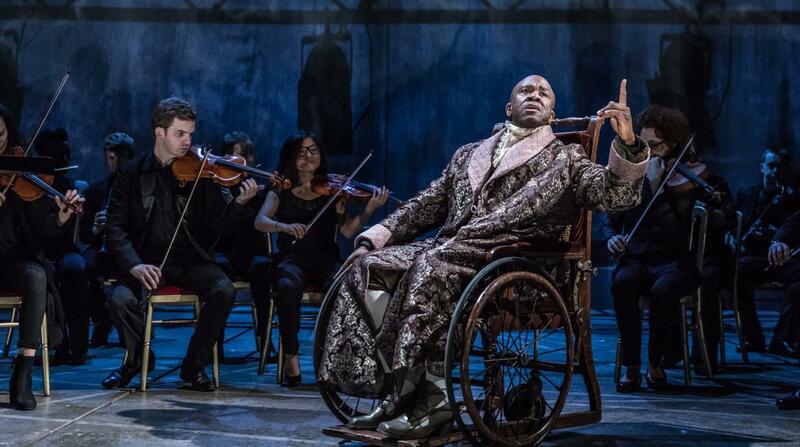 Opening on a bare stage, the musicians assembled and in front of them Lucian Msamati's elderly Salieri in a wheel-chair addressed the audience, but interacted with the musicians too. 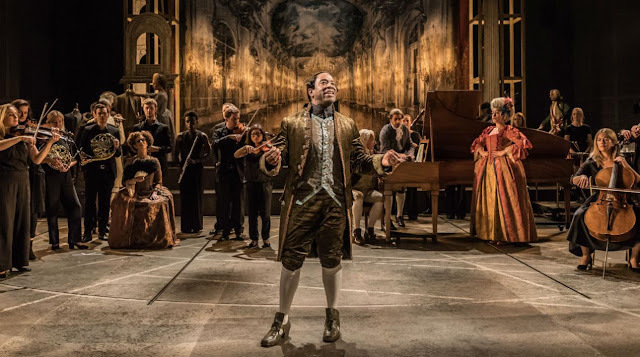 For much of the play they were on stage, contributing and interacting, sometimes playing Mozart's music and sometimes other work (the extra music was by musical director Simon Slater), and sometimes just making noises. The settings were assembled before our eyes, with fragments of columns, drapes etc, and the musicians and supers pushing things on and moving things about. 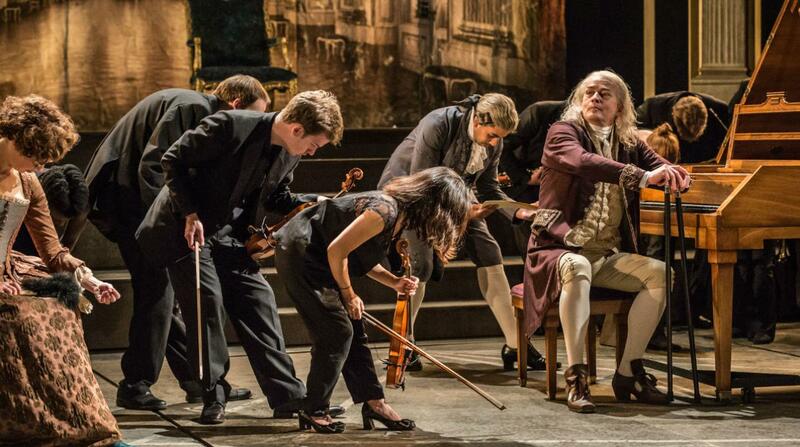 This was a production which celebrated the very theatricality of Mozart's art. The singers were all characters in the play, so that Fleur de Bray was Salieri's mistress Katharine Cavallieri, for whom Konstanze in Die Entfuhrung aus dem Serail was written (so we heard her in an extract of the opera). Wendy Dawn Thompson was Salieri's (largely silent) wife, and the remaining singers (Matthew Hargreaves, Peter Willcock, Eamonn Mulhall and Robyn Allegra Parton) all played smaller roles, but they came to the fore in the extracts from Mozart's operas having to turn their hand to Fiordiligi, Dorabella, Figaro, the Commendatore, the Queen of the Night and many more. Perhaps the oddest operatic sequence was the nightmare version of The Magic Flute which re-wrote everything and was, presumably, meant to be disturbing. Whenever Salieri referred to a piece of Mozart's music, we usually heard some of it, including the magical moment when he hears the wind serenade in E flat, the first piece of Mozart's Salieri has heard. When Salieri leafs through a sheaf of Mozart's manuscripts we hear snatches from the different pieces, as he reads them. 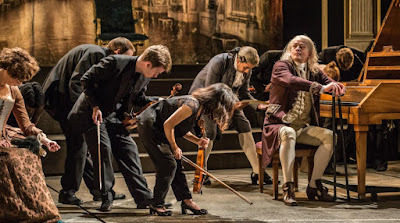 The performance of the Requiem, which involved virtually the entire cast, was both the culmination of the drama and the logical conclusion of the use of live performance. In other places, I wondered why we had to have Slater's souped-up electronic disco versions of Mozart, and you felt that the singers were not used as extensively as they could have been. But that would have pushed the production into the direction of music theatre and made it even longer. The sound design was sometimes a little disturbing, and I was aware that we were not listening to the natural acoustic. This was quite a long evening, three hours and 15 minutes including a 20 minute interval. And frankly, despite some superb individual performances and a spectacular production, the evening began to pall and you realised that though the play might be iconic, it has its limitations. This was particularly true of the closing scenes, and it would have benefited from significant tightening. 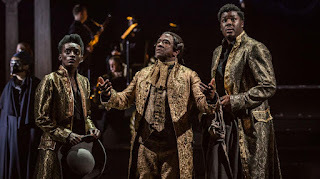 Lucian Msamati was impressive as Salieri, both the old man worrying and the younger one discovering that his pact with God had gone awry and that Mozart was the far finer composer. What Msamati could not manage to do was to make us care for Salieri. We might be impressed and fascinated, but could not sympathise with the man's plight. 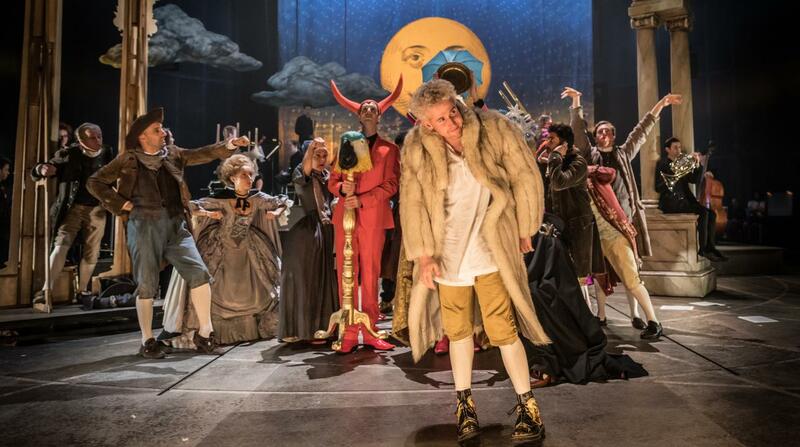 Adam Gillen as Mozart looked alarmingly like Malcolm Maclaren, and his behaviour seemed to channel both anarchic punk and the Marx brothers. It is understandable that for Schaffer's rather schematic plot that Mozart be a potty-mouthed buffoon, but Gillen seemed to relish every detail and hardly made us care for the musician underneath. And frankly, by the second half of the play I was beginning to find Gillen's punk/Marx goofy schtick extremely wearing. The remainder of the cast were strongly supportive, with Karla Crome as a nicely tart Constanze, and Geoffrey Beevers as the po-faced Swieten. Sarah Amankwah and Hammed Animashaun were the two narrator characters, Venticelli, who gently led us through the vicissitudes of the plot. Watching the piece, we always have to bear in mind that this isn't history it is simply a play. And frankly one which does neither Mozart nor Salieri justice. Mozart was nowhere near the gurning buffoon that was depicted, and Salieri was a rather finer composer than the play implied. Having lived in Vienna since he was 16, he also, as far as I can understand, regarded himself as a German composer that than an Italian one. The use of live music, however, added a disturbing level of validity to Schaffer's re-write of history, as if by hearing Mozart's music live we were reinforcing Schaffer's view of his personality. This was a superbly theatrical event, and one which largely disguised the weaknesses of the dramatic material. I loved the way that music and musical performance were placed at the centre of the piece, making something of a metaphor for the work's meaning.